Breast Cancer Action is a national education and activist organization working to achieve health justice for women at risk of and living with breast cancer. We don’t take any money from any corporation that profits from or contributes to breast cancer—including pharmaceutical companies, chemical manufacturers or cosmetic companies that use toxic ingredients. That means that 75% of our funding comes from individuals--women living with breast cancer, or people whose loved ones have been affected by breast cancer. Most of our donors give small donations, and their support allows us to remain an independent, unbiased voice for women’s health. Every donation means a great deal to us—we are deeply grateful for our donors’ investment in ending the breast cancer epidemic. In the 1960s, a woman had a 1 in 20 chance of developing breast cancer. Today, despite billions of public and private dollars devoted to breast cancer, that number is 1 in 8. We are losing the war on breast cancer. Breast Cancer Action (BCAction) exists to address the system-wide changes that are needed if we are going to truly end the breast cancer epidemic. BCAction was founded in 1990 because a group of women in a breast cancer support group were frustrated with the lack of information about breast cancer, a sentiment tragically shared by many people who contact us today. Our founders -- only one of whom is still alive -- knew that their private medical crisis was part of a larger public health emergency, and that the experiences of those dealing with breast cancer needed to be heard to address the crisis. Twenty-one years later, BCAction continues to help women cut through the confusion and find answers to the most pressing breast cancer issues. 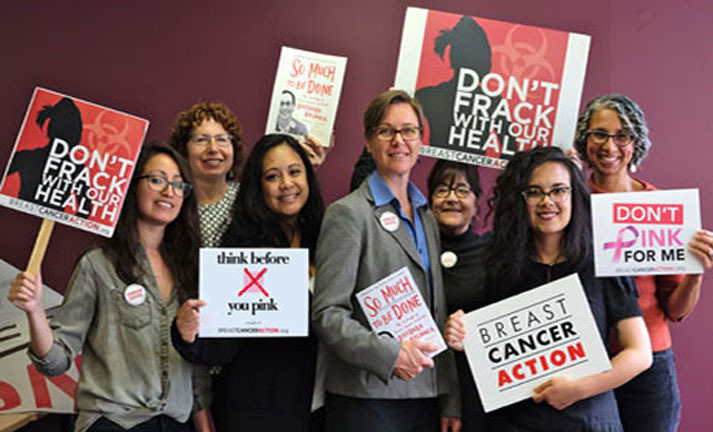 BCAction remains a grassroots group: ordinary people who -- by educating themselves on the facts and the issues related to breast cancer -- have empowered themselves and others to make informed decisions. Today, BCAction is a nationally recognized leader in the breast cancer activist movement. A disease that is dominated by the pharmaceutical industry and not patients when it comes to device and drug approval at the Food and Drug Administration. Through public education, direct support to individuals, collaboration, community-based organizing, and policy and media advocacy, we are working to end the breast cancer epidemic. Since our founding, BCAction has been advocating for eliminating toxins in our everyday lives that increase women’s risk of getting breast cancer. We work for changes that ensure the protection of everyone's health. One member and breast cancer survivor said, “I am eternally grateful to Breast Cancer Action for their vigilance. It is a luxury for me to go through my life knowing BCAction is there doing what they do." For example, we successfully got rBGH—an artificial hormone linked to breast cancer—out of 2/3 of the dairy market (including Yoplait and Dannon brands). We successfully advocated for removal of phthalates—a toxin linked to breast cancer-- in cosmetics made by Secret, Arrid, and Christian Dior. We are currently campaigning for stronger federal regulation of all toxic chemicals that are in our everyday products and are linked to an increased risk of breast cancer—like lead in lipstick, bisphenol A in canned soup, and formaldehyde in nail polish. Educate our members and the general public about undue influence in the drug approval process at the FDA. Advocate for improved safety and accountability by encouraging Congressional oversight of industry influence at the FDA, and for policy changes at the FDA that enhance patient safety. Challenge biotech and drug companies to fully disclose the efficacy and potential dangers of breast cancer treatments. We put your money to excellent use. Over 80% of our funding goes to our programs. We are independently audited every year and have a terrific volunteer Board of Directors who ensure the organization is fiscally responsible with donor funds.